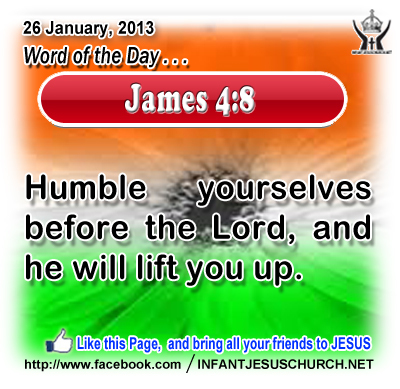 James 4:8: Humble yourselves before the Lord, and he will lift you up. Heavenly Father, most Holy God, thank you for allowing us into your presence. When we think of all that you have done, the incredible universe you have made and hold together by your word, we are amazed you invite us into your presence. We are amazed that you even care about our choice of words. Thank you for knowing us and having a plan for our life. Help us this day to live with humbly and grace before others as we seek to glorify you in all things. Through Infant Jesus we pray. Amen. 19bThen he went home; 20and the crowd came together again, so that they could not even eat. 21And when his family heard it, they went out to seize him, for people were saying, "He is beside himself." On one occasion Jesus remarked that a man's enemies will be the members of his own family. The Gospel of Mark records the response of Jesus' relatives when he went home: they came to seize him. How could a good home-body from Nazareth leave his carpentry trade and go off to become a wandering preacher? Jesus had thrown away the security and safety of a quiet and reputable life close to his family and relatives. He probably expected some resistance or reaction from the highest religious authorities in Jerusalem. The tough opposition, however, may come from someone close to us, even your own kin. Are we ready to obey and follow the Lord even if others be against our doing so? Loving Infant Jesus, help us to put you first in all our thoughts and concerns. And may we always find joy in doing your will, even in times of difficulty or opposition.